Make new friends and find old ones! (there are almost 700,000 licensed ham radio operators in the U.S. - almost 2.5 million world-wide) and growing! Ham Radio via Balloons, Bicycles, Hiking, Boating, etc. Amater Radio is about having fun, learning new things, spreading good-will internationally, and helping others. Above, I'm having fun at Maumee Bay State Park, on the shores of Lake Erie while camping with the family. 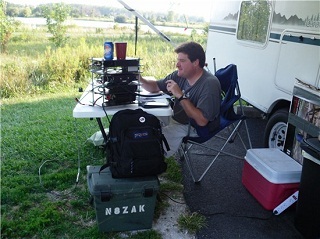 That weekend was the Ohio QSO party. I even ran into operators monitoring 14.260 Mhz during Hurricane Irene. Copyright © 2008-2013 Zachary Burns - N8ZAK. All Rights Reserved. - Last Updated 3-15-2013.